A U.S. Marine now in the hands of Iraqi insurgents had deserted the military and was on his way to Lebanon when he was captured, a newspaper reports. The New York Times quotes an unnamed Marine officer as saying Cpl. Wassef Ali Hassoun, a linguist originally from Lebanon, was traumatized by seeing his sergeant blown apart by a shell. The officer said Hassoun may have been betrayed by Iraqis he met at his base, who promised to help him desert but instead turned Hassoun over to kidnappers. Hassoun had previously told a cousin that he heard several GIs had bribed Iraqis to help them flee the country. 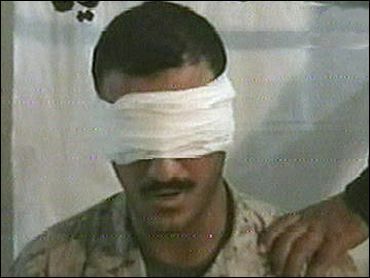 Hassoun was shown blindfolded in a video released Sunday, in which his captors brandished a sword and threatened to behead Hassoun unless Iraqi prisoners are released. Two other hostages in Iraq have been executed by beheading: American Nicholas Berg last month and South Korean Kim Sun-Il last week. On Tuesday, the military changed Hassoun's status from "missing" to "captured." Hassoun, of Lebanese descent, was last seen about a week before the videotape was broadcast Sunday, the military said. "The circumstances surrounding the Marine's absence initially indicated that he was missing," a statement by the 1st Marine Expeditionary Force said. "However, in light of what we have observed on the terrorists' video, we have classified him as captured." Hassoun's eldest brother, Mohammad, who lives in a Salt Lake City suburb, denied The Times' report. "To me it has no foundation. It's all wrong," Mohammad Hassoun said Tuesday night. Capt. Amy Malugani, spokeswoman for the 1st Marine Expeditionary Force from Camp Pendleton, declined to comment on the report Tuesday. She also would not say what steps the Marines were taking to rescue Hassoun. That report came after Turkey's foreign minister said Tuesday that Iraqi insurgents freed three Turkish hostages, while two other Turkish captives reportedly told their families they would soon be released. The Turks were among dozens of people kidnapped in Iraq in recent months. Most have been freed, but several were slain — two by being beheaded. "Our citizens have been released," Foreign Minister Abdullah Gul told state television. "We've struggled a lot for their release. We are glad to hear this news." He spoke after the Arab television station Al-Jazeera reported that the group responsible for beheading two other foreign hostages had announced it was freeing the three Turks. The abduction of the Turks was claimed by Jordanian terror mastermind Abu Musab al-Zarqawi, whose followers killed Berg and Kim. On Monday, kidnappers in Iraq released a video that apparently showed militants killing a captive American soldier with a gunshot to the head. The captors identified their hostage as Spc. Keith M. Maupin, 20, of Batavia, Ohio, who has been missing since an attack on a fuel convoy on April 9. The U.S. military is analyzing the tape to determine whether the man was Maupin.